Mandate: To serve the global mission of the Catholic Church through the administration of the entrusted assets and providing payment services to the Holy See and related entities. The celebration of human life, creation, and human dignity are fundamental Catholic principles and values that are to guide the institute’s investment choices and always prevail over return consideration. The lowdown: In 2018, the Institute’s Board of Superintendence approved a faith-based approach to apply to all its financial investment, notes board president Jean-Baptiste Douville de Franssu, former CEO of Invesco Europe, who is on a mission to bring the IOR back to its ethical roots. It is difficult to verify how this is working in practice as the IOR does not publicly disclose any of its corporate bond or equity holdings. It does, however, provide its asset allocation breakdown: 97.2% of its €2.4 billion (C$3.7b) in investment securities is composed of government bonds issued by major European countries (core and peripheral), as well as financial and corporate bonds. One of the reasons the Vatican may be weary of holding equity positions and disclosure in general could be because of previous periods of intense scrutiny including in 1968 after media reports revealed controversial investments in Udine, a military weapons manufacturer, and Istituto Farmacologico Serono, a firm that once made birth control pills. A new foundation, based in the Vatican City, “Quadragesimo anno” was set up in 2018 to create a certification system meant to ensure financial investments are in accordance with the social doctrine of the church, which could be a valuable tool for Catholic faith-based investors. Mandate: To create profitable sustainable enterprises that stimulate job growth, support entrepreneurial activity and contribute to overall economic output in places that lack access to capital, with 100 per cent of profits reinvested in further development. The lowdown: The fund discloses 78 subsidiary or associated companies (eight of which are publicly traded) spanning 19 countries across five different economic development themes. Many of the investments appear to be aligned with the Sustainable Development Goals, a gold standard for ethical investors. Unlike the IOR, the fund discloses the names of companies it owns, so it is possible to do a partial evaluation on a few key corporate social responsibility indicators. Relative to a global index of comparator companies (MSCI ACWI), the eight publicly traded companies held in the AKFED demonstrated a high rate of tax payment (48% of profits over the past five years), below average female representation on the board (12%) and higher than average CEO-to-average worker pay ratio (160:1), according to analysis by Corporate Knights. The fund claims impressive impact metrics that include generating electricity for 10 million people and providing quality health care to five million people. Holdings include the largest independent media house in East and Central Africa (Nation Media Group), a hydropower facility that provides half of the power for Uganda (Bujagali Energy), the leading telecoms provider in Afghanistan (Roshan, a certified B Corporation) and the largest commercial bank in Pakistan (Habib Bank, a leader on microcredit and women’s financial inclusion). The latter investment, however, landed the fund in hot water in 2017, when Habib Bank paid out a US$225 million (C$306m) settlement to the New York State Department of Financial Services for compliance failures at its only U.S. branch, which has since been shuttered. Mandate: To oversee the church’s endowment, which needs to return a substantial income to “support the church of today and the church of tomorrow.” The ethical investment policy embraces stewardship, engagement and investment exclusions in activities that are materially inconsistent with Christian values. The lowdown: The Church Commissioners disclose their 20 most valuable property and equity holdings. The fund has relatively large positions in dental supplier Henry Schein and LED-firm Acuity Brands, but unlike the Church of England Pensions Board, does not count Apple, Amazon, Facebook, JP Morgan or Wells Fargo among its top 20 equity holdings. Relative to a global index of comparator companies (MSCI ACWI), the commissioners’ top 20 disclosed equity holdings demonstrated below average rate of tax payment (14% of profits over the past five years), above average female representation on the board (25%) and a higher than average CEO-to-average worker pay ratio (157:1), according to analysis by Corporate Knights. The paltry 14% of profits paid in taxes is the worst result among prominent religious funds analysed by Corporate Knights and even in the context of engagement stands at odds with the Archbishop of Canterbury lamenting that vast companies “leech off the taxpayer” by not paying their taxes. Relative to its benchmark, the commissioners reported both a higher exposure to climate solution companies (9.7%) and a bigger portfolio carbon footprint (313 tonnes of carbon dioxide equivalent per £1 million of corporate revenue). The Church of England has active campaigns to use the combination of its investor and moral power to combat corporate tax avoidance and assist the transition to a low carbon economy by high carbon global companies through its involvement with the Transition Pathway Initiative (TPI). 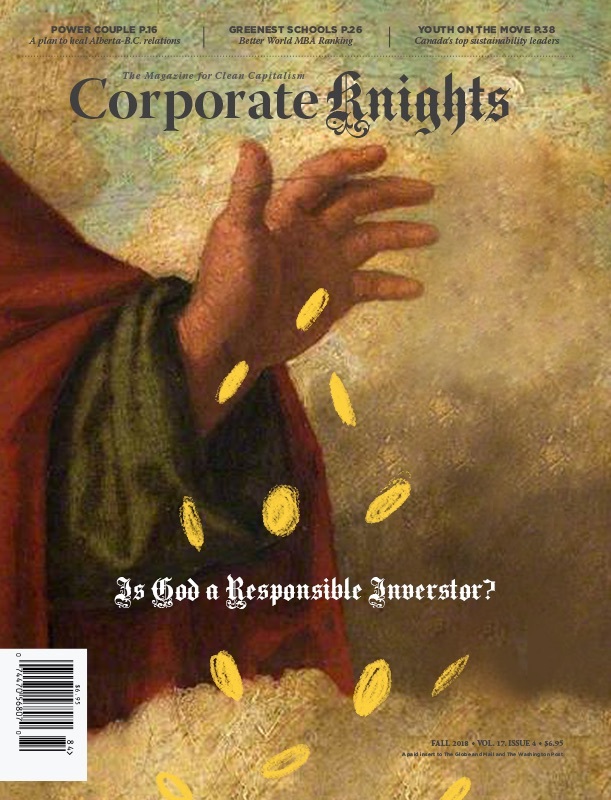 Read our Winter 2019 cover story, Is God an Ethical Investor?